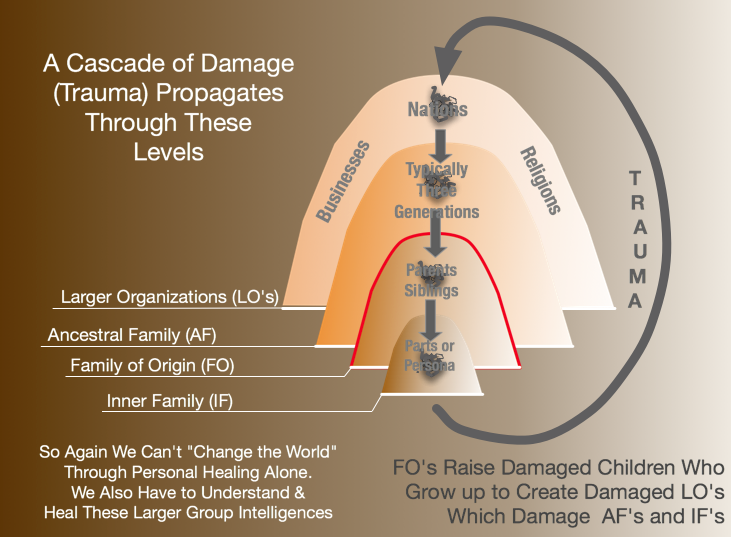 It starts with my ground-breaking vision of how trauma works on and cascades through levels of human collectives. It does the same thing on all of them. With the right domain knowledge, the same toolset works on all of them. 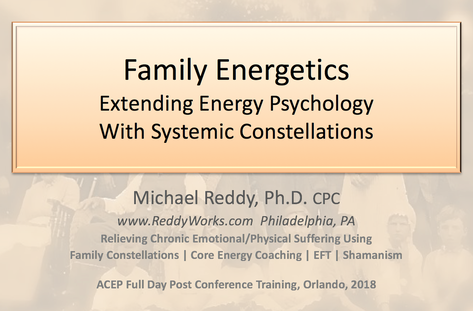 Integrating Family Constellations, Energy Psychology (EFT, EMDR), and Gestalt "Two-Chair" Processes (which are baby constellations)--Family Energetics reunites conscious and sub-conscious parts of the self in healthy harmony. The techniques allow you to move smoothly through healing individual, inherited family, archetypal, and past life trauma--AS NEEDED. 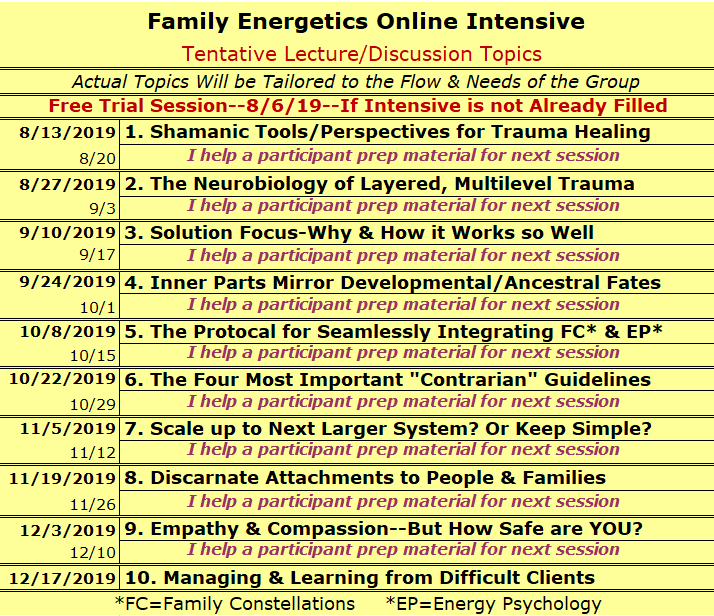 Also, each of part of Family Energetics improves the effectiveness of the others. If you are curious, or wondering whether this is right for you, please let's have a short chat. This is now happening 12 weeks later than what you may have seen previously advertised. Who Am I to Teach This? If you know my classes, the intensive will be like the best of the Home Altar Practicum on steroids. If you're not familiar with my books, classes, articles, music, or conference presentations--I'll say this. I have an experience base that blends academic cognitive science, business systems analysis, shamanism, and deep trauma healing. I've always been a bridge-builder and creative integrator. My unique approach seamlessly marries conceptual with empathic, intuitive, and psychic skills. I'm passionate about it all, because, in the end--this long exploration changed and actually saved my life. As a trainer, I'm known for clear, vivid, memorable explanations and diagrams. One picture, one apt metaphor--worth a 1000 words. And I'm honored and happy to say these things are being recognized now in a more public way. My long intellectual and experiential journey will be part of Gayle Kimball's forthcoming book on "Visionary Scientists." She is the noted and prolific author of 20 books. Other people in this book are Nobel prize winners and major keynote level thought leaders. Here's part of Gayle's interview of me for the book. "Michael you are brilliant! Thanks for the diagrams... Rock on!" Get the powerful story of how family constellations saved my life when you opt-in to my newsletters. They are rich in useful content, and keep you up to date on new methods, healing tips, trainings, conferences, etc.